I chose a hard dinghy powered only by oars as I didn't want the added complication of storing, fuelling and maintaining an outboard engine. 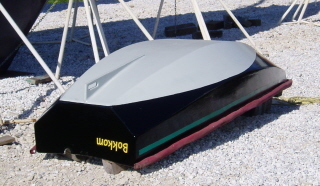 Bokkom is a slightly modified 'Nymph' designed by Phil Bolger. 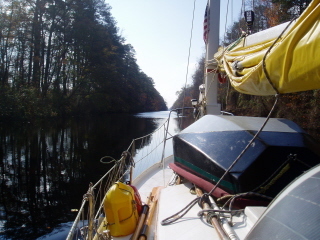 I had to build her about 6" shorter than designed to fit on the foredeck. That was when Speedwell was still Bermudian rigged. Unfortunately after moving the mast forward to accomodate the junk rig there was no longer space ahead of the mast and she has to be lashed down partly on the cabin top obstructing my view forward a little. 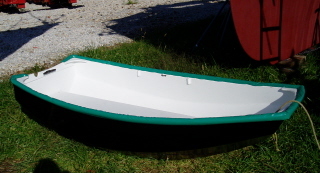 The dinghy is made from 4mm marine ply with an outer skin of light fibreglass cloth and epoxy. She is very light and can easily be lifted aboard without resorting to block and tackle. 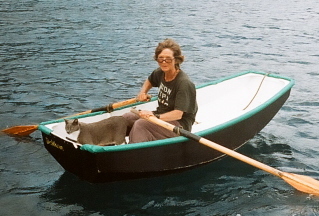 I use very ordinary one pot paint as the dinghy is hard working and regularly needs touching up. The colour scheme changes now and then depending on what paint I have available. She is named "Bokkom" after a little salted dried fish which is regarded as a delicacy on the Cape West Coast where Bokkom was built. I enjoy rowing and feel that if I did have a small outboard I would probably only use it if the wind or current was too strong for me to row against, which means that I would be putting a bit too much faith in what would probably be a dodgy little engine. So when the wind picks up, I stay on board. Admittedly there have been occasions when I have been grateful for a tow back to the boat if I've been caught out ashore.